The sleepy town of Varkala is located in the state of Kerala in Southern India. The town lies on India’s west coast and is about 50 km north of the city of Trivandrum. The breathtaking cliffs lining the beach here makes for extraordinary sunsets. The gorgeous beaches are some of the most sought after for surfing enthusiasts from all over the world. The beach here is cleaner and less crowded in comparison to other beaches along the Arabian Sea coastline. The resort area has two cliffs, north and south, overlooking the beach areas. The main beach, called Papanasam, is between these two cliffs. Folklore believes that this beach has holy waters which will wash away sins. Another beach, named Black Beach is located further north. There is a sidewalk along the cliff edge that allows travelers to access the different parts of this small resort town. 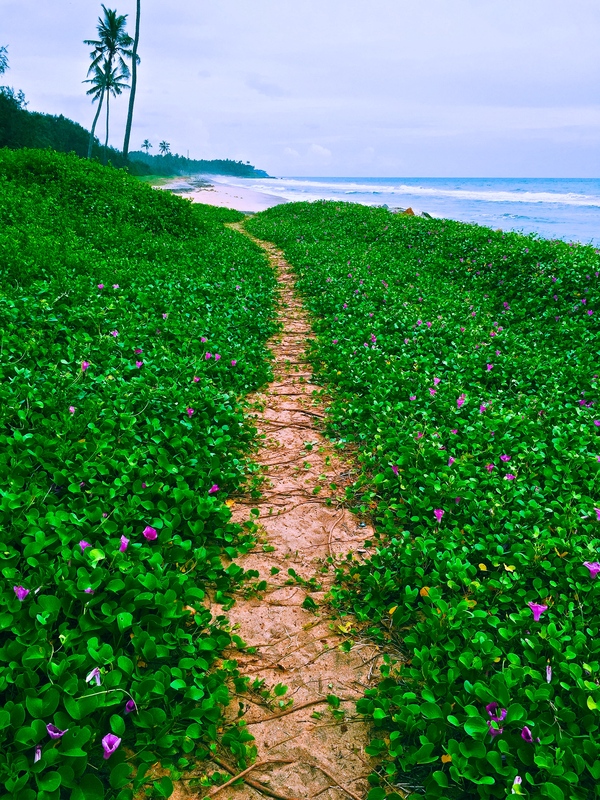 Additionally, Varkala has lush greenery, coconut and banana farms in excess, beautiful backwaters, fishermen communities, great seafood and a sleepy vibe that the state of Kerala is known for. Travelers can easily rent a scooter for about $5 a day and drive around the town as well as visit historical temples. With yoga retreats and Ayurvedic massages galore, Varkala makes for a calming getaway (for all ages) from the maddening shroud that can sometimes be the rest of India. Kerala is an extremely precious part of India with beautiful landscapes and backwaters in abundance. So, it is very important for us to be responsible tourists. I believe in supporting the manual boats and canoes rather than the bigger houseboats as those are known to be encroaching on the delicate ecosystem. The disposal of diesel into the water pollutes the marine life and the water that is used by the local fishing and farming communities. The monsoon season runs between May and October, with the heaviest rainfall historically in June, July and August. I, personally, love watching the thunderstorms over the sea, especially from up top of a cliff, so I don’t mind a visit during monsoon time. However, for travelers short on time, it is probably best to avoid the rainy season. Summer, from March to May, can be very humid and very hot. The winter months from December to February offer warm and dry weather and are the most optimal time to visit. December can be an expensive month to visit India ( in general) as it tends to be popular amongst tourists. January is a good fit for those trying to catch dry weather, escape extremes of heat, and avoid expensive markups on hotels and flights. The high temperature in January is still in the mid 80s (or around 30 degrees Celsius). It is perfectly alright to wear bikinis/bathing suits/swim trunks while at the beach. However, I would strongly recommend covering up properly if moving away from the beach and/or climbing back up to the cliff area in order to be respectful of the local culture and also avoid uncomfortable stares. Wearing cotton shirts and comfortable trousers/skirts to go into town is a good idea to cover up appropriately while also remaining cool as the temperatures can get pretty high during the day. The nearest airport is Trivandrum(TRV) and one can easily catch a taxi to Varkala for about $20. Alternatively, one can also take the train – Kanyakumari Express – to Varkala Sivagiri Station. If you plan to fly into Kochi (COK), which is another city in the state of Kerala, the train ride south to Varkala is about 4 hours. I would recommend the train, as the ride provides gorgeous views of the lush landscape. At the time of this post, non-stop flights to TRV and COK are available from Mumbai, Delhi, and Abu Dhabi. Cheap flights to India often involve at least one stop from the United States. Non stop flights from New York and Newark are available to Delhi and Mumbai on Air India and United Airlines, which often save time, but are more expensive. 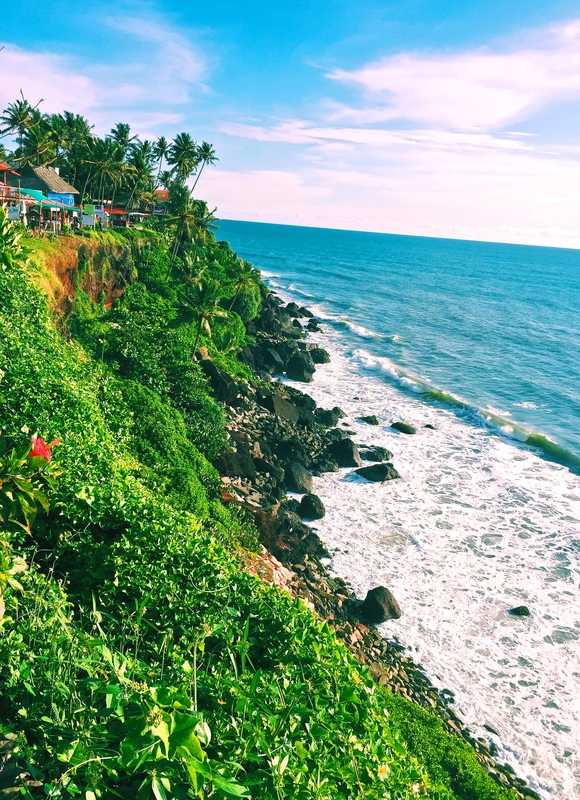 Although Varkala is one of the chillest and safest towns in the area, it is always a good idea to be cautious. The town goes to sleep quite early, so use caution if walking around after dark. In fact, past sunset, there is not much to do in the evening hours. You can hang out at one of the restaurant bars on the cliff, listen to the waves crash, and watch the fishing boats return home after a long day’s work. Travelers can opt to take a quick day trip to the nearby Ponnumthuruthu Island, also called the Golden Island. While in the Golden Island you can take a relaxing manual boat rides along the water. The Golden Island is just 12 km south of Varkala. 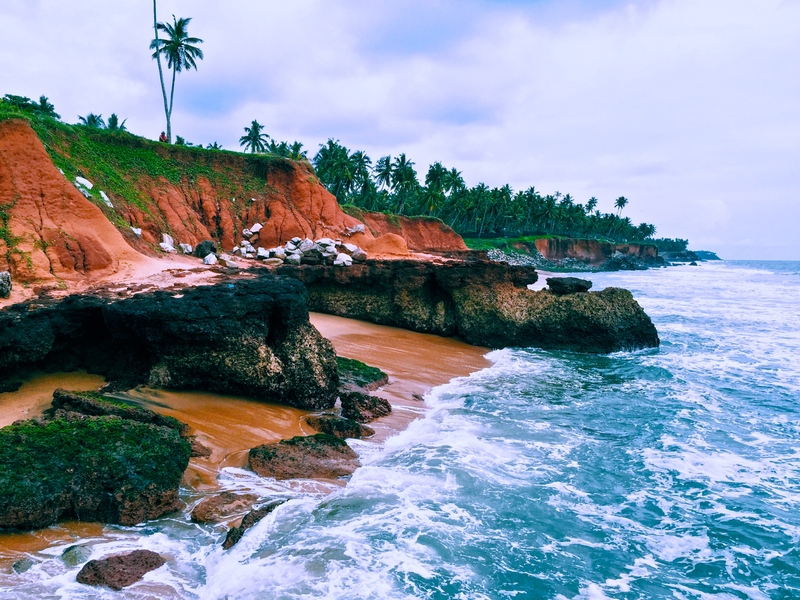 Varkala is also famous for the Janardana Swami Temple, a two thousand year old shrine, which is often referred to as Dakshin Kashi (Benares of the South). The temple is in close proximity to Papanasam beach. While Varkala is usually visited for the beach and yoga, you may also want to experience the famous Kerala Backwaters. 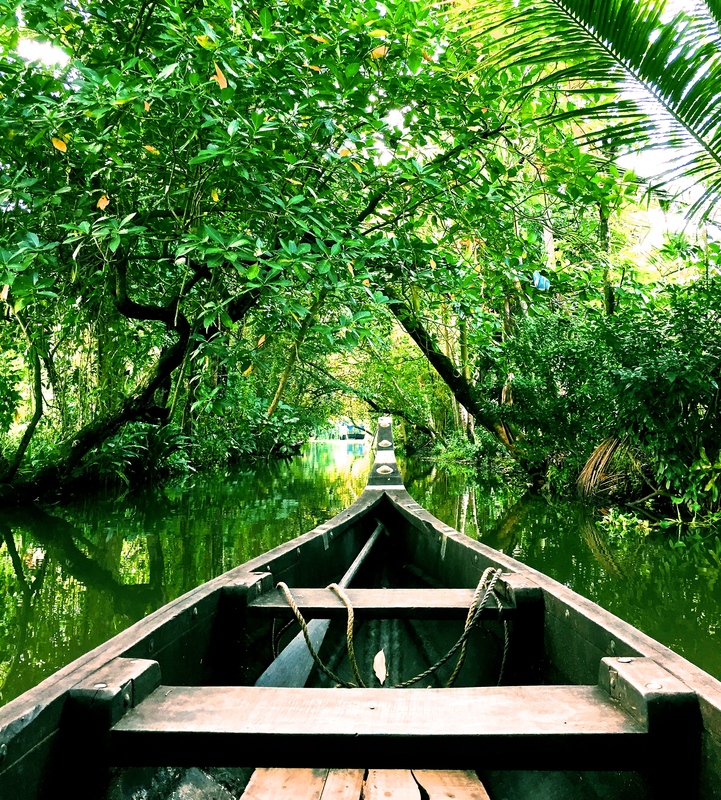 The three most well known regions of Kerala’s backwaters are Astamudi, Vembanad, and Kannur-Valiyaparambu Backwaters (in districts of Kannur and Kasargod). The backwaters near Astamudi lake are the closest to Varkala. 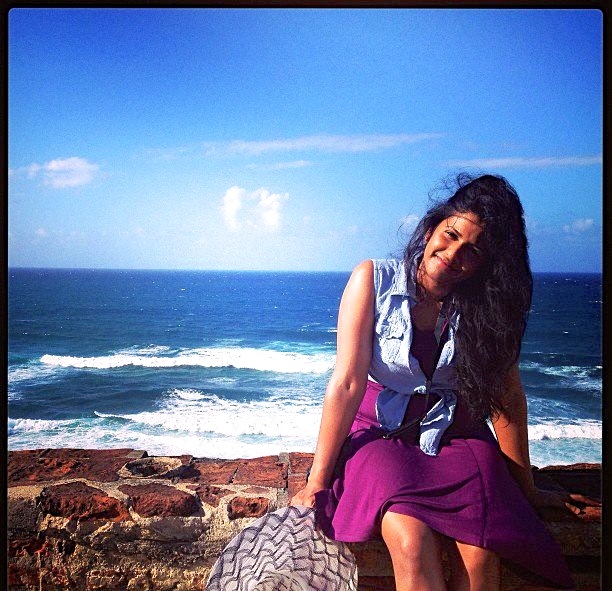 Thanks to Archana (former engineer, turned filmmaker, turned traveler, photographer, writer and dabbler at large) for sharing her travel recommendations with us!